Torres del Paine National Park is one of Chile's biggest claim to fame. Located in the Chilean Patagonia, travelers come here from near and far to discover some of the most spectacular natural wonders in South America. And so it is that the trekking inside the park has made quite a name for itself as well. 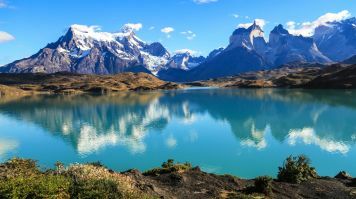 While the W trek is probably the most well-known, it would be a big mistake to overlook the more intensive option, the Torres del Paine O Circuit. Also known as the "Full Circuit" and the “O trek”, this trail leads trekkers on the most comprehensive and rewarding trail in the park. It's the best choice for those who want to see more remote and untouched areas. You’ll see the iconic Las Torres (the three rock towers), as well as Glacier Grey. But you’ll also embark on very trying but oh-so-rewarding journeys, like the John Gardner Pass, which aren’t available to those who opt to take the W Circuit. Read on to find out if you're up for the O Circuit Challenge! Start/end locations: Most people start and finish the Full Circuit at the Laguna Amarga Ranger Station, which is at the park’s entrance. Difficulty level: Challenging. The amount of time spent on the trail and the ruggedness of the conditions will require trekkers to be physically fit and possess an above average endurance level. Duration: Roughly 120km. It can take anywhere between 6-10 days to complete the full loop; however, 8 days is the most common duration. Remoteness: Trails are well marked throughout the trek, and there are plenty of accommodation facilities. The backside of the O trek has the most remote and challenging terrain. This is the side of the National Park the W trek does not pass through. Accommodation type: Most nights can be spent in refugios, which are shared accommodation shelters. However, when you reach the backside of the O trail, there is only one refugio available. According to our itinerary below, two nights camping are mandatory. Note: All accommodation available in Torres del Paine National Park needs to be booked at least 3-6 months in advance, regardless of the season or whether you choose to camp or stay in refugios. Even the free camp sites (outlined below) require reservations. 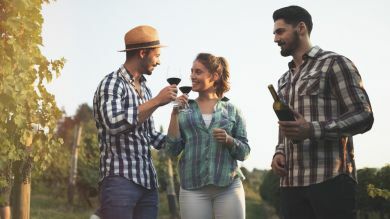 You also need to reserve camping gear (tents, sleeping mats, sleeping bags) at the time you make your reservation if you don’t plan to bring your own. Be sure to bring a print out of your reservation with you or be able to show the confirmation of booking on your phone. Best seasons: The best seasons to trek the Torres del Paine O Circuit are Spring and Summer. This gives you a 7-month window from September – March. Do note that the weather differs during the two seasons. Be aware, it can get very windy during these two seasons! In fact, it can be so windy that trails may close due to unsafe trekking conditions in high winds. Gusts can reach up to 110mph (180kph). Spring (late September – November) sees average high temperatures around 11°C (51°F) and average low temperatures around 3°C (37°F). This tends to be the windiest season. *Reservations for all accommodation should be made at least 3 months in advance if you plan to visit in spring. Summer (December – March) has average high temperatures around 14°C (57°F) and average low temperatures around 6°C (42°F). *Reservations for all accommodation should be made at least 6 months in advance if you plan to visit in summer. Winter (June – August) can be very cold with temperatures dropping considerably to -3 – 5°C (26 – 41°F). While the park remains open, and the W route of the O Circuit is possible with a guide, a complete full circuit cannot be entertained. Permits required: There is a park entrance fee that is required to be made in cash (Chilean Pesos) at the front entrance. Find out more about it under our guide to Torres del Paine Treks. Day 1: Leave by bus from Puerto Natales, a home-base to trekkers outside of the park's entrance. Proceed to the entrance to pay your park permit fee. The trekking begins from the Laguna Amarga Ranger Station at the park gates. (The bus will carry on to the Hotel Los Torres, so if you prefer you can get off at the hotel and start the trek. The only difference is in the shorter distance to Camp Seron). It’s about 12km of trail from the ranger station to Camp Seron, roughly 5 hours away on relatively flat, wooded ground. Spend the first night at Seron. Day 2: Seron to Refugio/Camp Dickson. Begin the 19km trek with views of Lago Paine. Lunch is eaten on the trail by your own means or lunch box requested from Camp Seron the night before. Stay the night at Refugio Dickson or the adjacent campsite. Day 3: Dickson to Los Perros Campsite. On this leg of the O Circuit you have the chance to view Glacier Los Perros and Glacier Lake. The total distance is roughly 10km. Stay the night at Los Perros Campsite. Day 4: Los Perros to Camp Paso (free). An early start at 7am for the most challenging portion of the trek. 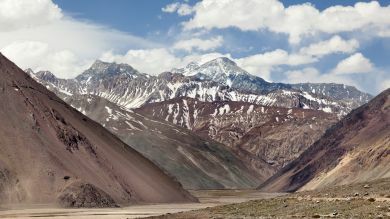 The highest part of the trek, the crossing of Paso John Gardner, is 1,241 meters. The remaining terrain is also quite steep and challenging. Arrive to Camp Paso after 12km and spend the night here. Day 5: Camp Paso to Refugio/Camp Grey to Refugio/Camp Paine Grande. This day leads you along the banks of the mountain as you make your way about 21km. This route presents breathtaking views of Glacier Grey. Stop and have lunch at Refugio Grey and then carry on to Refugio Paine Grande. Spend the night here in either the refugio or the campsite. Day 6: Paine Grande to Camp Italiano to Refugio Cuernos. Day 6 presents the best opportunities to appreciate the fauna and flora as you pass through Valle de Frances. View Mount Paine, complete with hanging glacier and natural waterfall created by the constant ice melt. Before you reach Valle de Frances, you will have the opportunity to leave your big backpack at Camp Italiano, then proceed to the viewpoint for the valley. Return to Camp Italiano, pick up your bag, and continue to Refugio Cuernos. This is the longest day with a total trek of roughly 22.5km. 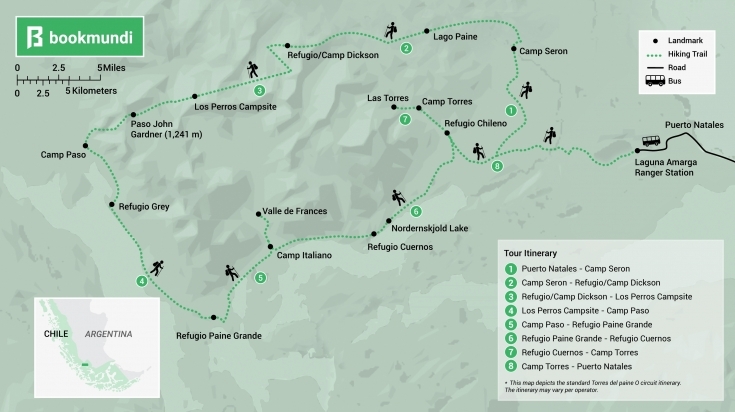 Day 7: Refugio Cuernos to Camp Torres (free, but reservations are mandatory). On this route, you pass the picturesque Nordernskjold Lake. There are postings about a shortcut to Refugio Chileno; follow this sign. Lunch at Refugio Chileno before embarking on the last leg of the journey to Camp Torres, which sits at the base of the famous rock formations known as The Towers. Set up camp then trek up to experience your first view of Las Torres. Return to Camp Torres and spend the night here. The total for the day is around 20km. Day 8: Torres to Puerto Natales. This is the final stretch! It’s an early morning rise to head back up to The Towers again to experience them at sunrise, but it’s more than worth it. Leave your big bag at camp and just take a day pack on this first part. Upon your return from Las Torres, pick up your big bag and make your way back to the park entrance, Laguna Amarga Ranger Station. In total, your last day is about 15km. If you'd like to pick a fantastic tour, here is a Torres del Paine Full Circuit tour that lasts for 9 days! For those who'd like to complete the trek in a slower pace, this 11 day trekking tour of the Full Circuit is ideal. Find all Full Circuit tours here! *Another option is to end the circuit at Hotel Torres and then take a bus to the entrance gate to catch another bus back to Puerto Natales. Doing this shaves 7 - 8km off your last day’s total. Once you're on the Full Circuit trek, there's not really a way to vary it unless you turn around and double back on yourself. There wouldn't be much point to this and you'd miss whatever section lies ahead. If you just can't get enough of this park (and who would blame you? ), you can trek the Q Circuit instead. This trek is almost entirely the same as the O Circuit apart from the first day. Day 1: Just as it is for the Q Circuit, you start by taking a bus from Puerto Natales. Pass through the entrance gates and pay the same permit fee. Then, instead of starting the trek from here, you carry on with the bus to the starting point of the Q trek which is Administracion. It is the final bus stop inside the park. From Administracion, you commence on a 5 - 6 hours trek on mostly flat ground, making your way to Refugio Paine Grande where you will stay your first night. After spending the night at Grand Paine (remember, either camping or in the refugio), you pick up the O Circuit, heading counter-clockwise on the trail towards Camp Italiano. Basically, you will follow the standard Full Circuit itinerary starting with Day 6. So, while the order of how you see the park changes, you still see everything. The end point will be Grand Paine again. From here, take the ferry across Pehoe Lake to Pudeto. From Pudeto you can catch a bus back to Puerto Natales. Check out all Torres del Paine tours to make your pick! Bring a tent that can withstand heavy winds, but is also lightweight. If you don’t want to carry your own camping supplies (tent, sleeping mat, sleeping bag), all the campsites will rent everything you need. Just make sure you tell them so at the same time you make the reservation. Even if you’re not staying in the refugios, you can still have all your meals in the refugio’s restaurants and/or order lunch boxes to take with you on the trail. Aside from the obvious camping/trekking gear and clothing, helpful items to bring include wet wipes, a walking stick, a towel, and flip flops for when you’re in the camp grounds or refugios (in the warmer seasons). Let your feet breathe! For more information on suitable trekking gears, read our guide to equipments needed when trekking. Porters (people who carry your bags for you) are available to hire. There are plenty of tours available for Torres del Paine Full trek, if a solo expedition is not your cup of tea. The Torres del Paine O Circuit is a once in a lifetime experience. It presents one of those rare opportunities to become one with nature. The O trek (and Q trek) is special because it’s not something that everyone has the time, commitment, or drive to do. If you’re among the minority that decide to take on the O Circuit, we can almost guarantee you won’t regret it. But don’t take our word for it; start planning for your trek in Torres del Paine today! 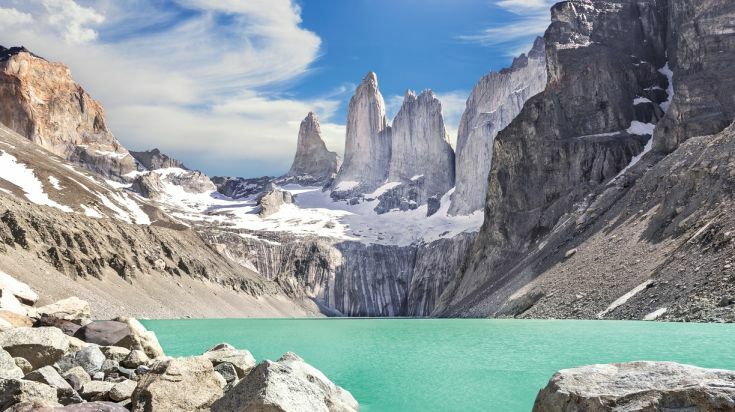 While the Torres del Paine treks are the most popular trekking trails in Patagonia, there are other lesser known treks that are equally, and often more rewarding. Take a look at our list of best treks and hikes in Patagonia to learn more! Since Patagonia is notorious for unpredictable weather, do check up on the best time to visit Patagonia before planning your tour. 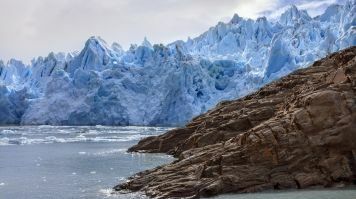 Click on the link for more information on Patagonia and the tours available.